US National Championship G/30 and G/60 tournaments where organized by Bay Area Chess last September 23-24th respectively. 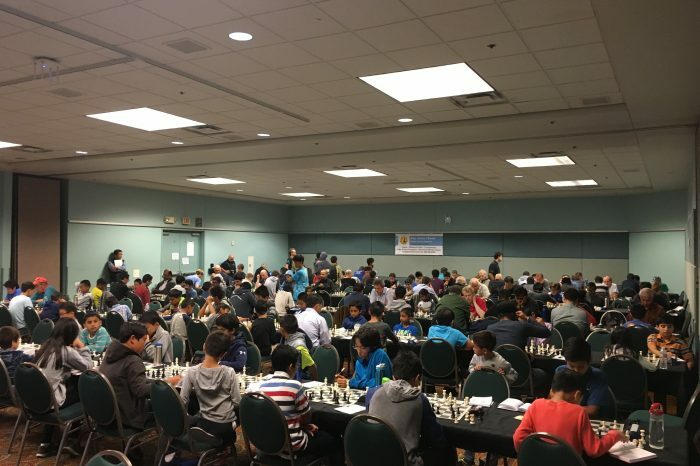 It was held in the Santa Clara Convention center that attracted 11 Grand Masters in the pool for hundreds of players. Ahyan became the champion in Under 1600 section in G/30 format scoring 4.5 out of 5 games! In the process he also earned $663 prize money. This is his second national title. In 2014 he was National Junior champion for Age group 8 and under - a little more than 3 years ago. After 4 rounds Ahyan was 3.5 and had to defeat the leader Jacob who had full score of 4. So Ahyan was in a must win situation and he made it! USCF published an article on this tournament where Ahyan's name was mentioned generously. "Ahyan Zaman, a rising talent whose father also competed in the Open section, took clear first in the u1600 section." "Two young Mechanics’ regulars had outstanding results in the G/30. 10-year-old Adrian Kondakov defeated his first Grandmaster, Carlos Matamoros of Ecuador, and Ahyan Zaman won the C group with 4½ from 5." My own performance was ok, got 2 small prize checks in both G/30 and G/60 sections. But the memorable one for me was defeating the very gentleman IM Anthony Saidy in G/60 in a King's Gambit. After the game Anthony told me that it was his first King's Gambit game in his long chess career. Here is Ahyan's final round win for the championship title.